When we think of the National Aeronautics and Space Administration (NASA) today, what comes to mind are trips to Mars and robots on the moon. However, NASA has been supporting students and professors through research grants since its inception in 1958. 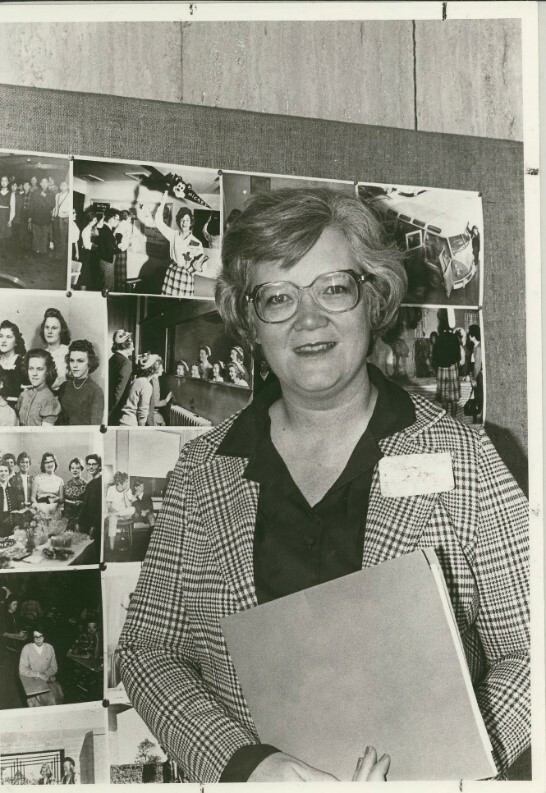 The WLA collection is fortunate to house the collection of a woman whose work was supported by a NASA grant: Alice Bourke Hayes, a biology professor, Associate Academic Vice President, University President, and all around amazing woman. Alice Bourke Hayes was born in 1937 in Chicago, Illinois. She received her B.S. in Biology from Mundelein College in 1959, and her M.S. in Botany from the University of Illinois at Champaign-Urbana in 1960. After receiving her PhD in Biological Sciences from Northwestern University in 1972, she returned to Rogers Park as a professor and the chair of the department of Natural Sciences at Loyola University. In 1980 she became the Associate Academic Vice President at Loyola, but that did not stop her from continuing her study of botany. 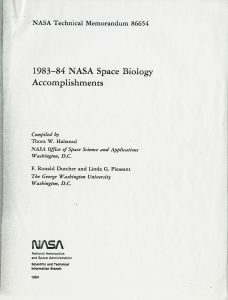 From 1981-1985, Dr. Hayes received grant money from NASA to support her study of pinto bean plants which she had begun in 1969. 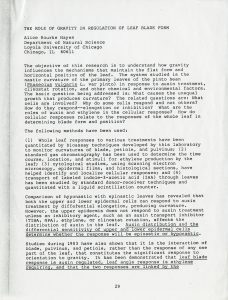 Under the title, “The Role of Gravity in Regulation of Leaf Blade Form,” she used the money to “understand how the normal leaf maintains its flat form, and how the diseased leaf curls up when infected with microorganisms or exposed to air pollutants”. Dr. Hayes and her graduate students observed the responses to gravitational stimuli, rotation, and amount of indole-acetic acid (a growth hormone) on pinto bean plants’ leaf position and leaf form. 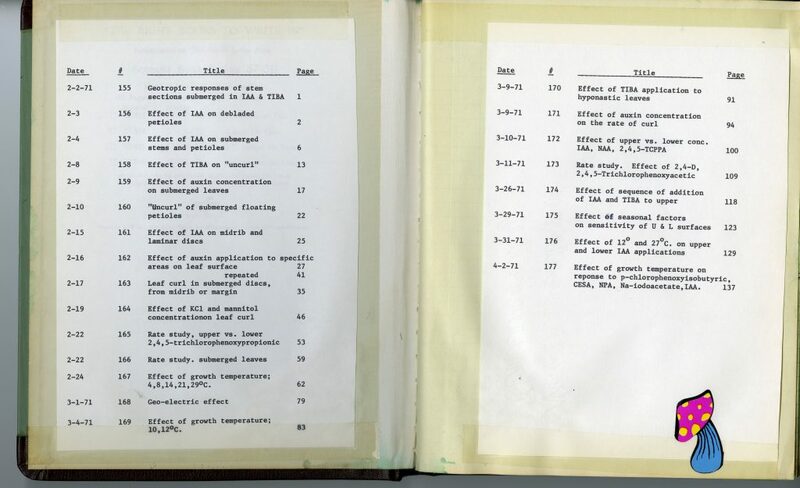 In 21 notebooks within our collection, Dr. Hayes’ handwritten observations, graphs, sketches, and data tables track the multitude of experiments conducted over 16 years. I am not going to pretend like I fully understand exactly what her data says, but I am not pretending when I say, it is unbelievably cool to have data in our archives that could be used in space. Dr. Hayes encompasses the true drive and passion scientists have: she did not need to study pinto bean plants for 16 years, nor was it part of her contract as Associate Academic Vice President; she did not even use the grant money to pay herself. Her passion, loyalty, and dedication to the field of science is obvious and infectious- read her papers and journals here at the WLA and find out for yourself! 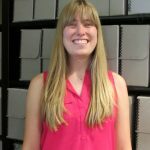 Emily is a Graduate Assistant at the WLA and is in her first year in the joint Public History/Library Information Science program with Loyola University Chicago and Dominican University. She enjoys going on long walks with her puppy, visiting cool museums, and cheering on the White Sox during baseball season. Loyola University Chicago’s Women and Leadership Archives Blog is designed to provide a positive environment for the Loyola community to discuss important issues and ideas. Differences of opinion are encouraged. We invite comments in response to posts and ask that you write in a civil and respectful manner. All comments will be screened for tone and content and must include the first and last name of the author and a valid email address. The appearance of comments on the blog does not imply the University’s endorsement or acceptance of views expressed. AnswerMTI on At the Oscars!